The purpose of any photodetector is to convert electromagnetic radiation into an electronic signal—ideally one that is proportional to incident light intensity. Because they are compact, versatile, and can be produced economically in high volume, p-i-n photodiodes have become the detector of choice in applications from biomedical instrumentation to telecommunications. An n-type semiconductor material is doped to produce an excess of electrons, whereas a p-type material has an excess of holes, or an electron deficiency. At the pn junction, this disparity creates a concentration gradient that causes electrons to diffuse into the p-layer and holes to diffuse into the n-layer. This diffusion results in an opposing electrical potential, often referred to as an internal bias (see figure 1). In a region spanning both sides of the junction, this electrical force causes any charge carriers to be rapidly swept to the appropriate layer. Because charge carriers cannot reside in this region, it is termed the depletion region (figure 8.1).. 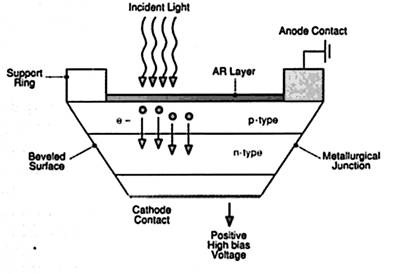 In a generic p-i-n photodiode, light enters the device through the thin p-type layer. Absorption causes light intensity to drop exponentially with penetration depth. Any photons absorbed in the depletion region produce charge carriers that are immediately separated and swept across the junction by the natural internal bias. Charge carriers created outside the depletion region will move randomly, many of them eventually entering the depletion region to be swept rapidly across the junction. Some of them will recombine and disappear without ever reaching the depletion region. This movement of charge carriers across the junction upsets the electrical balance and produces a small photocurrent, which can be detected at the electrodes. In many applications it is desirable to maximize the thickness of the depletion region. For example, device response is faster when most of the charge carriers are created in the depletion region. This also increases the quantum efficiency of the device, since most charge carriers will not have the opportunity to recombine. The quantum efficiency is defined as the ratio of the photocurrent in electrons to incident light intensity in photons. Figure 8.1. 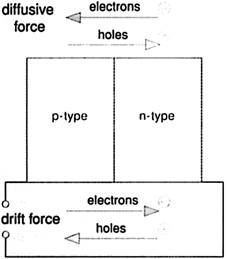 Charge carriers diffuse across the pn junction (diffusive force) driven by a concentration gradient that produces an internal electrical field across the junction. This field drives the carriers in the opposite direction (drift force). The resultant equilibrium condition results in a small internal bias voltage. The thickness of the depletion region can be modified by varying the semiconductor doping levels. However, the easiest way to expand this layer is to apply an external electrical bias (voltage). 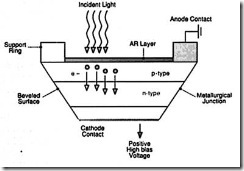 This is referred to as photoconductive operation, since the signal is detected as a current. Conventional unbiased operation is referred to as photovoltaic operation, because the signal is detected as a voltage. The latter is preferable for applications requiring high linearity of response and/or low dark noise. Manufacturers produce photodiodes in a wide range of shapes and sizes, with each design optimized to meet the specified parameters. The most important performance characteristics are response speed, quantum efficiency at the wavelength of interest, size and shape of the active area, response linearity, spatial uniformity of response, and dark noise or other noise sources that impact the sensitivity. Photodiode sensitivity is very important in low-light applications and is typically quantified by noise equivalent power (NEP), defined as the optical power that produces a signal-to-noise ratio of unity at the detector output. NEP is usually specified at a given wavelength and over a frequency bandwidth of 1 Hz and is therefore expressed in units of W/Hz1/2. Because the various performance parameters are interrelated, device design often involves careful tradeoffs to achieve optimum performance. For example, an application based on the detection of an unfocused source of light may require a detector with a large active area. If this application also requires high speed, then some compromise will have to be made because increasing device area raises capacitance, thereby increasing the R-C time constant, which slows device response. As a result, the majority of successful OEM applications use application-specific photodiodes. Most performance parameters, particularly speed and noise, also are strongly influenced by the design of the signal-processing electronics. The electrical characteristics of even a simple photodiode can be remarkably complex, however, so engineers often represent the photodiode with an equivalent circuit. This is a virtual circuit consisting of multiple components whose overall behavior matches that of the photodiode. Certain photodiodes can be represented as a current source in parallel with a diode, a capacitor, and shunt resistance, in addition to series resistance, for example. In more complex devices, the various noise sources (shot noise, Johnson noise, and 1/f noise) can be represented as additional current sources in parallel to the signal current source. There are a number of types of signal processing electronics regularly used with photodiodes, but by far the most common is the transimpedance amplifier (TIA). Normally, generating a highly amplified voltage from a given input current requires a high input impedance. The downside of a high input impedance is that it increases the R-C time constant. The TIA uses an operational amplifier to circumvent this problem and to deliver a high effective input impedance while maintaining a circuit time constant several orders of magnitude lower than a conventional amplifier with the same impedance. Moreover, a well-designed TIA delivers several orders of magnitude of linear response and therefore does not compromise the inherent high linearity of a photodiode. The majority of photodiodes are destined for OEM applications. Advanced packaging and integration technologies deliver increasing levels of sophistication and functionality to OEM customers. Typical examples of integrated products are photodiodes with on-chip TIAs and photodiodes with integrated thermoelectric (TE) coolers. Some assemblies also include sophisticated signal processing to ratio or normalize signals from a multi-element photodiode, for example. They may also incorporate optical elements to condition the light before it reaches the photodiode active area. One limitation of the p-i-n photodiode is the lack of internal gain—an incoming photon produces only one electron-hole pair. Low-light applications require detectors with internal gain to boost the signal above the noise floor of subsequent electronics and signal processors. For many years, however, the only device that provided such gain was the photomultiplier tube (PMT). Although it offers high gain, the PMT has a number of practical limitations: It is a bulky vacuum tube; it generates heat; and compared to a photodiode, it offers limited linearity, a narrow spectral response range, and a low QE (< 25%). Fortunately, the avalanche photodiode (APD) now offers a solid-state alternative for most PMT applications (see figure 8.2). In an APD, as with any other photodiode, incoming photons produce electron-hole pairs; however, the APD is operated with a large reverse bias (up to 2 kV for beveled-edge designs), which accelerates the photon-generated electrons. The electrons collide with the atomic lattice, releasing additional electrons via secondary ionization. These secondary electrons also are accelerated, which results in an avalanche of carriers, hence the name. For many years, APDs were only available with small active areas (less than 1 mm diameter). This limited their use to tightly focused or fiber-coupled applications. In the past three years, however, the large-area avalanche photodiode (LAAPD) has emerged as a mature device, with active areas up to 16 mm diameter and gains as high as 1000. Although the PMT still offers higher gain, the LAAPD features better quantum efficiency (up to 90%), lower noise, compact packaging, higher linearity, and better electrical efficiency. Furthermore, LAAPDs are available with integrated TE cooling for ultra-low-noise operation. As a result, LAAPDs are now replacing PMTs in applications such as flow cytometry and medical imaging. Although photodiode technology has been available for many years, ongoing advances in areas such as packaging, device integration, and thin-film coating are continuing to yield more sophisticated and cost-effective products. Thus, it is likely that these robust devices will not only continue to dominate the existing light-detection market, but also will seamlessly adapt into most developing photonics applications.